Join us for the 2nd Annual Savio Carnival! Game Booths, Prizes, Food, Music, Art, Photo Booth, Karaoke and much more! It's fun for the whole family. To purchase Tickets, Wristbands and Sponsorships please visit our link HERE. Savio's 4th Annual Wing Eating Contest kicked off Homecoming week Monday at Pluckers Lakeline. Savio students and parents packed the house to see if anyone could dethrone the returning Mrs. Artz. The battle was over before it even began though. Mrs Artz attacked the wings like a bad equation while the Athletic Directors tried out specific game tactics and Coach Estrada took the easy way out avoiding the dreaded Fire in the Hole wing. Fun was had by all and a portion of the night's proceeds were donated back to Savio. Thanks to all that came out to support! The St. Dominic Savio Eagle football team will try to regroup this Friday as they prepare to take on the undefeated Hyde Park Panthers for Homecoming 2015 at the Kelly Reeves Athletic Complex. Last Friday the Eagles traveled to the Alamo City facing the undefeated and unscored upon St. Mary's Hall Barons. St. Mary's Hall struck like lightning on their first play of the game completing a 64 yard touchdown pass to take a 7-0 lead. Then, on the Eagles' first possession the real lightning struck in the form of an hour-long thunderstorm delay. Despite the long wait the Eagles stormed back with a long touchdown drive of their own to tie the score at 7 apiece. But that's all the injury riddled Eagles would be able to muster as St. Mary's Hall rang up 21 unanswered points before the half, and cruised to a 40-7 win over Savio. The loss dropped the Eagles to 1-4 on the season. 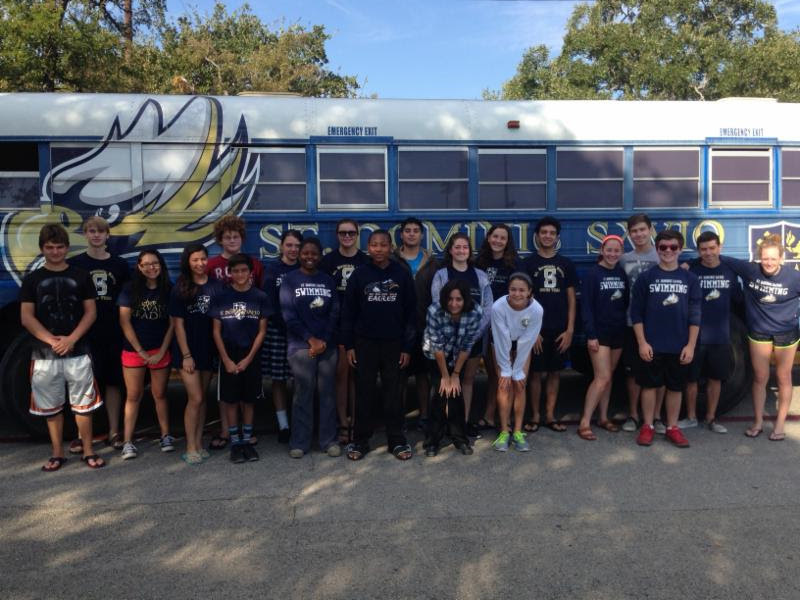 The Savio swim team was off to a great start with the season opening swim meet. Two team records were set, Natalie Reysa in the 500 Free and Hannah Espinosa in the 100 Breast stroke. There were 8 first time swims and 17/39 time improvements. The Savio Swim Team participated in a service project at the Central Texas Special Olympics Aquatics Competition on Sunday. It was held at the Nitro Bee Caves pool were they assisted with getting the participants to the ready benches, cheered for them and helped them collect individual awards and supported them throughout the meet. It was a great experience for the team! A depleted Savio Eagle football team showed early signs of fight, but St. Andrews proved to be too much for the injury plagued Eagles. Without two starters in the offensive and defensive lines, and another one lost late in the game, St. Andrews cruised to a 47-14 win dropping the Eagles to 1-3 for the season. Savio will travel to the Alamo City on Friday to take on undefeated St. Mary's Hall at 7 pm. Lanier High School put on a furious rally late in the fourth quarter to beat St. Dominic Savio 31-24 Friday night. The Eagles held a 24-23 lead late in the game but the Vikings returned a punt for a TD with 1:30 left in the game. The Eagles tried to rally but a fourth down pass fell incomplete to let the Vikings escape with the win. Turnovers, and crucial penalties at inopportune times doomed the Eagles. This Friday Savio will host St. Andrews at 7:00 pm at McNeil HS. The Waco Reicher Cougars weren't impressed with St. Dominic Savio's first win of the season over Cornerstone Christian as the Cougars scored at will on the Eagles in a 49-7 rout. While Savio dug themselves a 14-0 hole early in the first quarter, they managed to put together a 72 yard scoring drive to close Reicher's lead to 14-7. However, the Eagle defense could not stop the potent Cougar offense, and the Eagle offense couldn't muster any more scoring drives falling behind 28-7 at the half. It was more of the same in the second half as Reicher continued to dominate play. The Eagles will try to bounce back as they return home on Friday at McNeil HS to take on Austin Lanier for a 7 pm start. Savio junior Sean Grieshop may be fighting jet lag, but it was well worth it! The 16 year old swimmer just returned from Singapore where he was a fierce competitor at the FINA World Junior Championships. Sean was a vital member of Team USA. The United States took a team of 40 swimmers to the week long meet. All of the athletes qualified for the meet by winning first or second place at the US National Championship meet in August. Grieshop qualified in two events; the 200 Individual Medley and the 400 Individual Medley. Grieshop brought back a Gold medal in the 400 IM, beating the former World Jr Champ after an exciting race. He won Bronze for Team USA in the 200 IM. Grieshop was also selected to swim on the four by 200 freestyle relay for the US. He and his teammates not only took Gold, but broke a Jr World Record doing so! Grieshop says the most amazing part of representing the USA was when he was on the podium after nabbing the two Gold medals. He says he will never forget hearing his country's national anthem played and seeing the Stars and Stripes raised in his honor.